It was a Tuesday night and my friend E and I were in the Glen Waverley area and wanted to grab some dinner – I have been wanting to try out The Black Toro for a while so we thought we would give it a shot. It was about 7pm on a Tuesday and we hadn’t made a booking and when we arrived were told that all the tables were taken but that something should come up in about 15-20 minutes time and that they would call us the moment a table came available. We thought this wasn’t too long a wait and decided to go have a coffee in a nearby restaurant whilst we waited. Although we didn’t get a phone call (hmm?? ), we decided to go and see if anything was available about 30 minutes later and a table had happened to be free – so we were seated. The Black Toro is the venture from former Ezard chef, Garen Maskal and has a Hispanic theme to it offering a Mexican and Peruvian inspired menu which includes innovative and interesting tapas style dishes. It is located in the always bustling Kingsway strip in Glen Waverley (like I said we went on a Tuesday night and parking was a nightmare! And the restaurant was at full capacity). As the name suggest, there is a lot of black happening at the venue – from the signage to the wrought iron screens as you walk in the door and completed with dark timber tables and chairs. The lighting is dimly lit but enough to create a cosy and welcoming atmosphere. As you walk in you are greeted with the lengthy bar which is followed at the end by the kitchen. The main feature however, is the huge mural of a charging bull with smoking, angry eyes which helps to create the Latino vibe. The menu is separated into 4 different sections – Poco Plates (which are your smaller dishes), Grande Plates (which as the name suggests are your larger dishes), Sides and Salsas and finishing with Desserts. The Poco Plates consists of dishes from Cured Salmon to Wagyu Beef Sliders (which from looking around at what people were ordering was one the popular dishes) to Crab. There are also quite a few vegetarian options as well. I also like how the Pico Plates section tells you how many pieces will come in a serving – saves you the trouble from having to ask the wait staff. Grande Plates include Lamb, Beef, Whole Chicken, Fish and two Veggie dishes. At the bottom of the menu is a glossary for some ingredients or foods that you might not know about which is handy. The friendly waitress informed us that for the two of if we had about 2-3 poco plates and maybe 1 Grande plate that should be enough for us. We decided to go with 4 of the Poco Plates and also we got one side dish. You would think ordering 4 of the smaller sized dishes wouldn’t be enough but the serving size at The Black Toro is quite generous and even with these 4 “smaller” dishes we couldn’t finish all of our meals. The first dish we ordered was the Mushroom Taco with Corn Truffle, Ricotta and Chive – which comes in a serving of two – which was perfect for the two of us. The mushroom and Corn Truffle filling is dense with a garlicky flavour added to the mushroom, coupled together with the salty smooth flavour of the cheese – it was a great combination. The overall juiciness of the mushroom combining with the semi crisp taco bread was divine. The next dish – which I would have to say was one of my favourites for the night – was the Crispy Soft Shell Crab with Buttermilk Dressing & Sriracha. Sriracha for those of you who do not know is a Thai Hot sauce made from sun-ripened chilli peppers together with vinegar and garlic – and tastes spicy and delicious. The Crispy Soft Shell Crab came beautifully presented with the crab being the centre of the dish with the sriracha around the crab. The outer coating of the crab was perfectly crisp with just the right amount of saltiness, and the crab on the inside was fresh and flavoured perfectly. The buttermilk dressing was smooth and flavoured correctly and combining it with the spiciness of the sriracha and the saltiness of the crab was a great flavour hit in your mouth. The next dish we ordered was the Kingfish Sashimi with Orange Pressed Apple, Jicama and Burnt Agave Nectar. Once again the dish was beautifully presented on a long black dish which made the pinkness of the Kingfish and the Orange strand out. I was a tad bit disappointed with this dish, even though the Kingfish was fresh and had a great texture, the flavours just didn’t do it for me. The sweet and sourness of the orange and the apple paired with the Kingfish was nice but there was something missing in the flavour palate – it needed a bit of saltiness. The side dish that we ordered (as it came recommended by our waiter) was the Zucchini & Corn Fritters – which were fluffy parcels of yumness! As a side dish once again the quantity was huge as there were about 10-12 pieces! These serving sizes are really quite generous! We also got some house made chilli sauce to go with this dish which further exemplified the dish. E ordered the Sticky Chicken Wings with Cripsy Jalapeno and Coriander – which she was perfectly cooked and was crispy, glazed and salty on the outside whilst being juicy and soft on the inside. Even though we were both quite full, we couldn’t leave this place without at least trying out a dessert so we decided to share the Frozen Nutella Parfait, Broken Tres Leches Cake, Toasted Meringue & Banana. This was a rather interesting dessert – with each part being deconstructed. Tres Leches Cake is a ‘three milk cake’ which resembles a dense sponge cake and is quite delicious in its own right. It is made by soaking butter cake in three different types of milk – evaporated milk, condensed milk and heavy cream. The Frozen Nutella Parfait was the centre of the dish and the key to this dish and was filled with hazelnuts yet kept its chocolatey flavour. The other elements surrounded this centrepiece and put together it was a welcome sweetness. The Black Toro is a fantastic place for dinner – be it a catch up with friends or even a romantic dinner with your partner. It was established to bring something different to the Glen Waverley area – where the surrounding restaurants and cafes are of the Asian Cuisine – and the locals and non-locals sure do appreciate it. The dishes are quite different to what you would normally experience and show a range of skill and technique in its preparation. Having only sampled a few dishes I will definitely be visiting again to try out all the other delicious sounding dishes. Atmosphere / Ambience: Cosy, Comfortable and bit Classy – the lighting is dimly lit and makes you feel at home. Check out the Raging Bull mural on the wall – this is the centre piece of the restaurant. 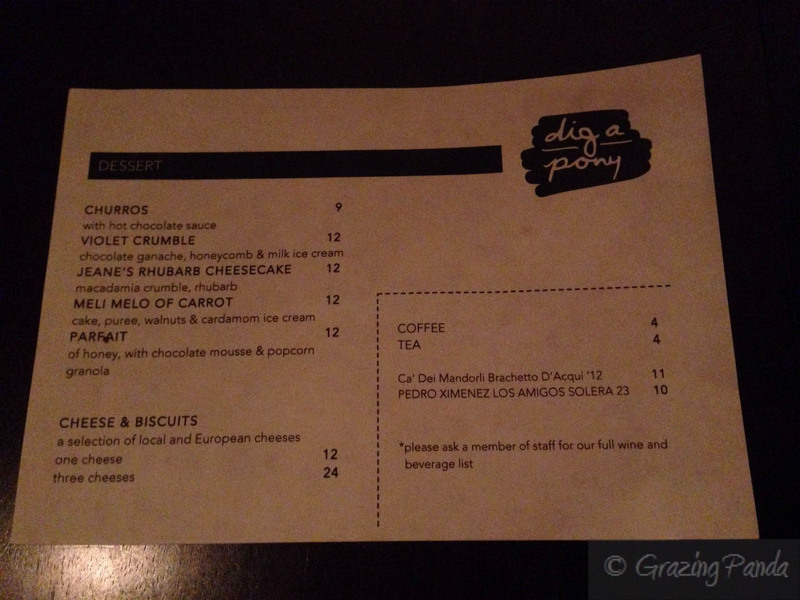 Touche Hombre – New Menu a Must Try! This wont be really be a full review but just an update. I recently went back to Touche Hombre and learnt that they had changed their menu 6 weeks ago. Now there is a lot more dishes to choose from and the food is even more tastier and spicier! There are dishes such as Fatty Lamb Ribs and Shrimp Balls (Spicy Shrimp Balls, Arbol Chilli, Charred Brea) that have been added a well as Quesadillas with Wild Mushrooms, Ricotta, Pecorino, Mint, Salsa Verde and Creme Fraiche. The fatty lamb ribs just melts off the bone and is full of flavour. The Shrimp balls are spicy and have just the right amount of heat to it and the shrimp is fresh. The Quesadilla was delicious and crunchy and the addition of mint and creme fraiche was great. The Grilled Corn (Elotes Callejeros – Grilled Corn, Alba Pecorino, Chilli Pequin) is just as good as I remember it to be on my first couple of visits – juicy, sweet and grilled to perfection. As I’ve said in my previous review – if you haven’t made your way down to Touche Hombre and really love Mexican food – definitely check it out! Atmosphere / Ambience: Very friendly staff who are interesting to chat to. An in-house DJ plays and the place is buzzing. There are old school pinball machines to play as well. A great night out with a friends or for a laid back date night. Service: Fantastic and super friendly! Online Booking: This place doesn’t take bookings. You have to go to the place and put your name and number on a list and they will call you. If you have a group of 10+ then you can make a Group Booking. Brooks Restaurant is a recently opened restaurant which has taken over the site where Jamie Oliver’s restaurant Fifteen was, and Tobie Puttock’s The Kitchen Cat. It is the joint venture between The venture of Gerald Diffey and Mario di Lenno. After dining here last night, I really do hope that Brooks is around for a long long time. The dining area hasn’t changed much at all since it was The Kitchen Cat, the layout is still the same. You are greeted at the entrance to the stairs with a BB handle on the door. As you walk down the stairs to the left of the stairs is a private dining room for group functions, and to the right is where the bar is located – here you can dine at the bar if you wish or if you keep walking through, it leads you to the formal dining area. From this dining area, you can look into the kitchen as the chefs fine tune your meals before they arrive at your table.. The service was impeccable and could not be faulted. The waiter we had was pleasant and friendly and made great suggestions on what we should and shouldn’t eat. 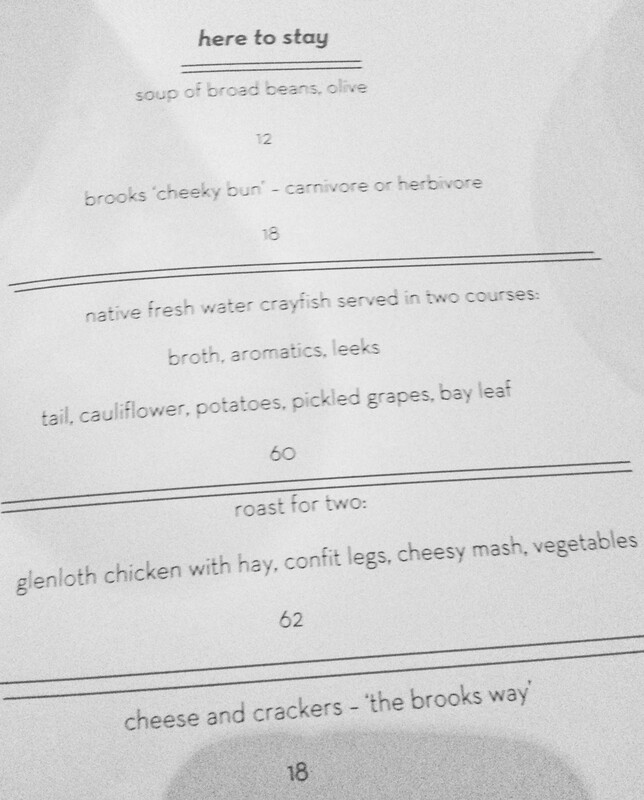 The menu at Brooks is somewhat limited – it is split into three parts In the Beginning (Entree items), Seasonally Visiting (which are items for the season) and Here to Stay (which are items that will be around a while). My friend and I each chose dishes from the Seasonally Visiting menu, and were told by our friendly waiter to try the Meli of Vegetables (pictured above) – which had over 30 different types of vegetables. When he said that, we were intrigued and impressed and wanted to see what the fuss was about. Our dishes came out and as you can see from the pictures, although the serving sizes are quite small – the dishes were beautifully plated. You could tell that there was a thought process that went into putting the food on the plate and the flavours had been carefully researched and designed. I had the fish of day – which was Rockling – the fish was flavoured and grilled just perfectly. My one gripe would be that the peas that came with it – some of them were hard. My friend had the Rump F1 Beef and she was a bit skeptical of the Hay flavouring and the Burnt Veg. But once she tried the whole dish together she said she almost got a cheeseburger like taste. She also said that the beef was cooked perfectly and tasted amazing. The Nic’s Sovenir of Bras: Meli of Vegetables – was a very colourful and interesting looking dish. There was indeed a vast array of vegetables and alongside that several different dollops of sauces which we were told by the waiter were made in house. Some of the sauces was a sweet strawberry tasting one, a creamy mayonnaise, a tangy sauce etc. I loved that you had a variety of sauces to taste of which you didn’t really know what flavour to expect. It added a bit of fun to the dish. Next was the dessert ( I had of course already looked at the dessert menu and knew what I wanted). There are only two desserts to choose from. The Forest Floor, Hazelnut Parfait caught my eye so I ordered that, and my friend was going to order the Lemon Curd but the waiter told us to share the Forest Floor and then he would give us a selection of the Petit Fours. I thought this was really nice of him – to suggest something other than making us pay for a dessert that we might not like. 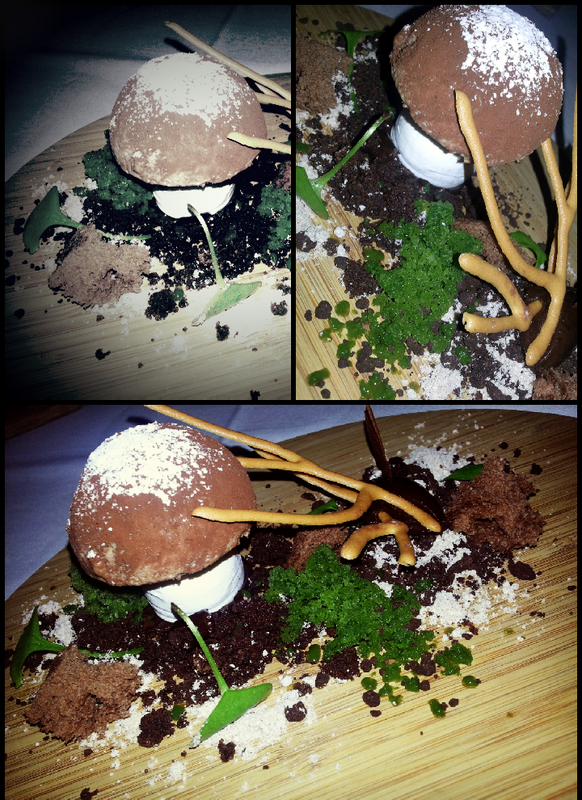 The Forest Floor dessert was beautifully created and I have had something very similar at Embrasse (located in Carlton). This I later realised was because the head chef is Nic Poelaert of Embrasse. I have dedicated a whole photo set to this dessert above. I love the mushroom which compromises of the Hazelnut Parfait and Meringue Base. The Forest Floor is a combination of Chocolate Ganache, Mint and Sorrell Granita. This is a definite MUST TRY dessert. 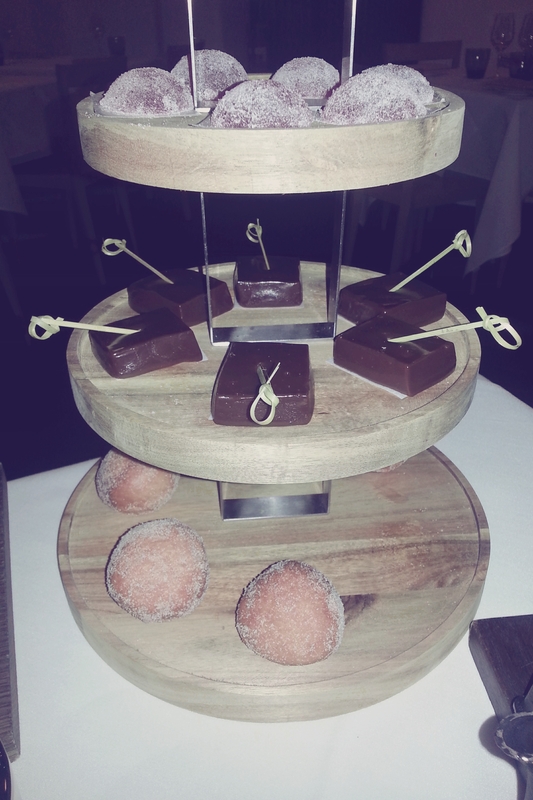 The Petit Fours were a Rhubarb Jelly with Sour Dust, Salted Caramel and a Donut with Passionfruit Cream. They all were DIVINE! The Donut with Passionfruit was really tangy when you first bit into it, but the after taste it leaves in your mouth was a creamy glow. The Salted Caramel had just the right quantities of sweet and salt. The Rhubarb Jelly was sour and sweet all at the same time and just as great. 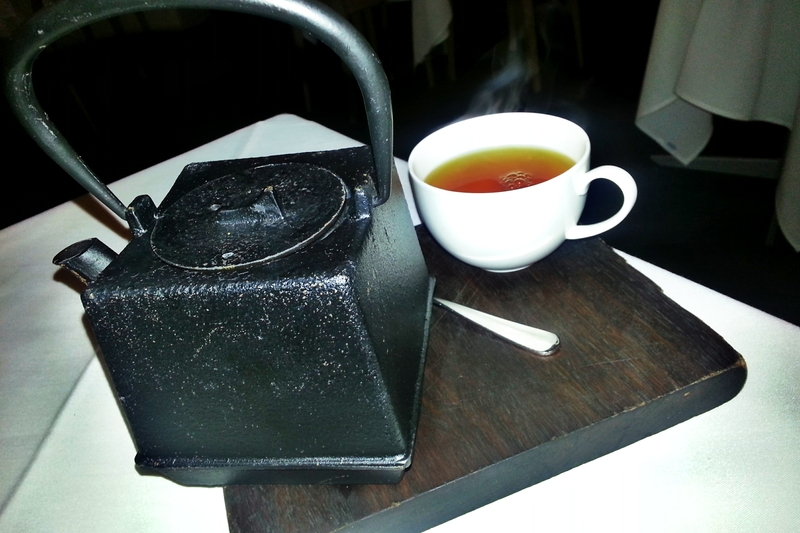 We also enjoyed teas with our dessert, and the pots were Cast Iron and oh so heavy, but really cute. I kind of wanted to take one home with me, hence a whole photo dedicated to it =p. The pot held quite a bit of tea and it almost felt like a never ending pot of tea! Overall I loved every moment of eating at this restaurant and will definitely be back to try out other things on the menu. The service was fantastic and I really do hope this restaurant sticks around for a long time! 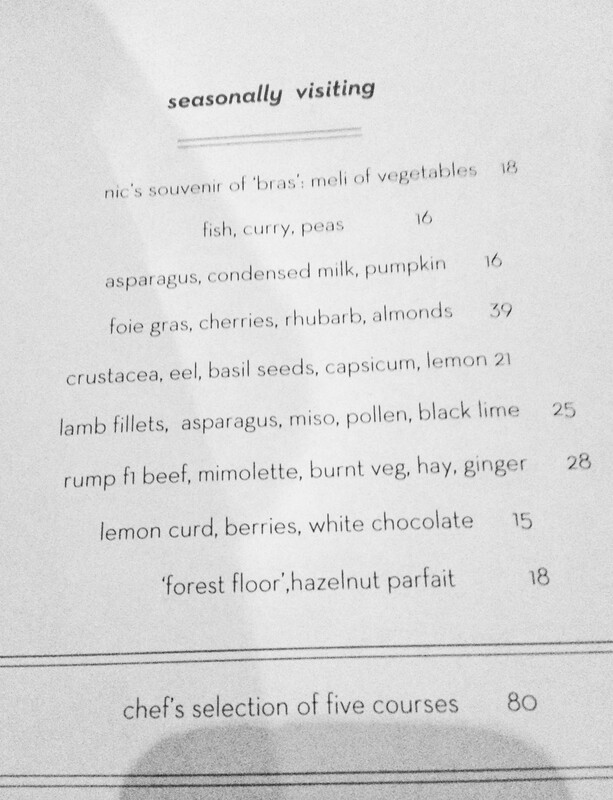 I cant wait to see what else Nic Poelaert will have on the Seasonally Changing part of the menu. 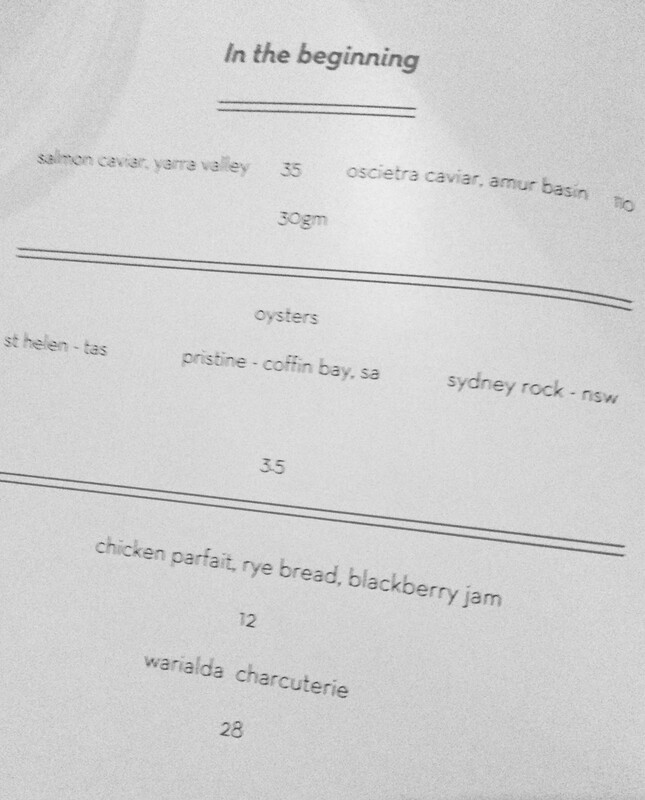 Menu – A la Carte or Degustation (Chef’s Selection of 5 courses for $80) – Refer to pictures above. Atmosphere / Ambience: Stylish and Comfortable. 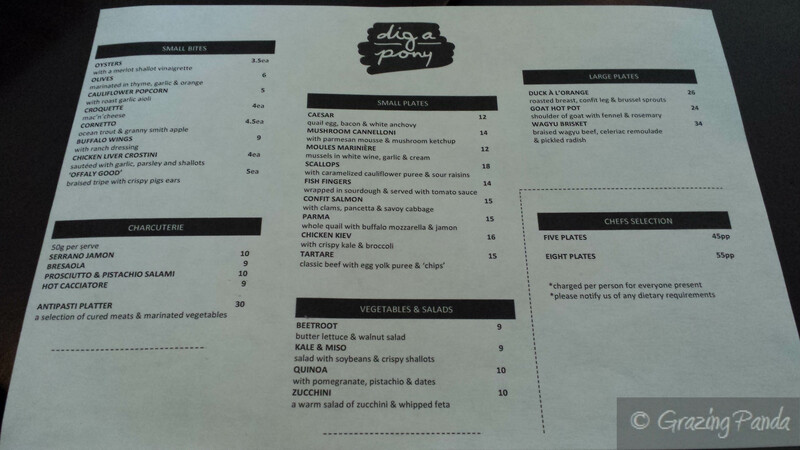 Great for a catchup dinner with a group of friends or just a one on one. Service: Fantastic, Attentive and Friendly. Also gave us some great choices and thoughts.